Board and batten siding offers your house a historical unique look that will make it stand out. If you are considering a siding job for your home, you should definitely look into board and batten siding because its rustic elegance and charming look may seduce you irremediably. But, if you are like most people, you only have an idea of board and batten siding. Read further on to understand what board and batten is, what are its advantages and what you should expect if you are going for this siding option. Board and batten is a unique style of siding that brings a distinctive and historical look to your house. It creates a vertical look with the siding boards; these boards are separated by a narrower board in between them covering the joints. When you have decided on this siding option, you should know there are many materials you can choose from: vinyl, engineered wood, traditional wood, etc. These materials have different levels of resistance and unique features, so you need to look carefully into them before deciding. For example, traditional wood is versatile, allowing an easier installation of this siding style, but it is less durable than engineered wood, while vinyl is immune to rot and termites, but is susceptible to cracking. The first advantage of board and batten siding is that it creates a distinctive look, adding to your house’s natural charm. Also, it is easy to replace because individual boards are being used. Board and batten siding is also cost – efficient and durable, making it an ideal option for people who want to benefit from a unique style without having to pay a small fortune for it. 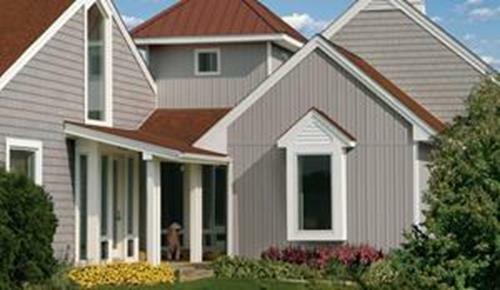 Due to its distinctive look, this style of siding can also increase your house’s market value. If you live in Vernon or Kelowna, then contact us for more information about this type of siding. Gut-R-Dun is specialized in exterior services, and we can do a splendid board and batten siding job for your house. We work only with premium suppliers to make sure that you receive quality and excellence, regardless of what type of job you hire us for. Call us to get your free, no obligation quote today: (250) 542-4492.